This application needs to be uninstalled before you can install PowerShell 2.0. Go to the Control Panel, select Add or Remove Programs, and check on Show Updates to see Windows Management Framework Core. If this is not checked, the application will not be visible in the control panel. When you try to uninstall it, you get a warning that IE 8 may not work correct. Ignore this and uninstall it. Once the Windows Management Framework Core is uninstalled, you can install PowerShell 2.0 without any problems. The Scripting with Windows PowerShell site is a good one to get started. There is a free tutorial on learning the shell, a graphical help file and cheat sheet, and a script repository with an extensive library of functions to save you time in building applications. FCKEditor is a text editor that you can use in a web page. It has many more options than the text input boxes in HTML. 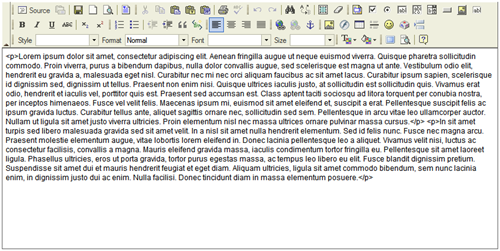 This is a WYSIWYG editor and resembles desktop applications like Microsoft Word. It supports multiple languages, but if you want to use it in an ASP.NET site, the ASP.NET control for it is required. The problem here is that the documentation doesnâ€™t fully explain how to use it in an ASP.NET 3.5 page. The following control should then appear on your page. There are many options to customize the editor which depends on the application that its being used in. You can download FCKEditor at http://ckeditor.com/.